Identical in function to the 808 series inside the trouser holster, however the leather is reversed with the textured side inside and the smooth side outside. Leather straps stabilize the holster and provide for more stability than a clip on holster. 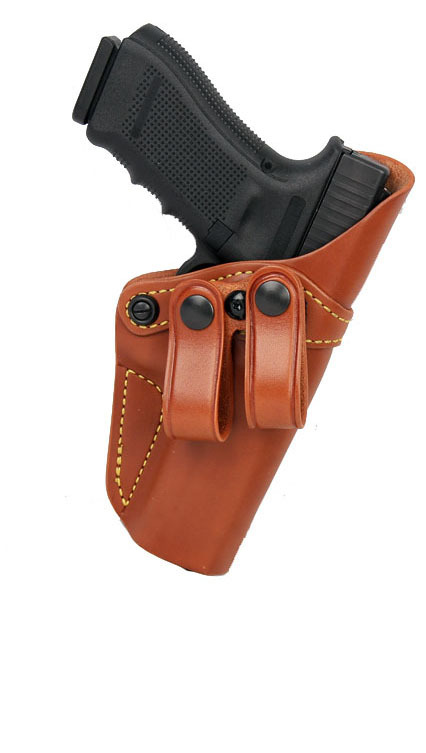 Additional features include a tensioning screw to adjust for retention, reinforcing band to keep holster open when drawing or re-holstering, and the ability to swivel the holster for maximum comfort whether worn strong side or cross draw. Fits Glock 19, 23, and 32.